The Opera House, heavily bombed down to its foundation walls during the WWII, was faithfully rebuilt to the original. 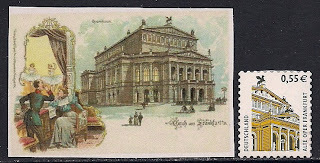 On August 28, 1981, the inauguration of the Old Opera House was celebrated. Throughout the year, there are performances of national and international ensembles and soloists in the Great Hall(2450 seats), famed for its excellent acoustics and fiited out in mahogany. It is now the home of Oper Frankfurt(the Frankfurt Opera), a leading opera company in Germany.